Punuku Tjukurpa is an exhibition of works from the Maruku Arts archive at Mutitjulu near Uluru in the Northern Territory. It features punu and walka boards created by three generations of Anangu (central and western desert people) from the Anangu Pitjantjatjara Yankunytjatjara (APY) Lands, Ngaatjatjarra Lands and Ngaanyatjarra Lands. Punuku Tjukurpa includes 88 punu works featuring burnt designs on carved wooden forms. 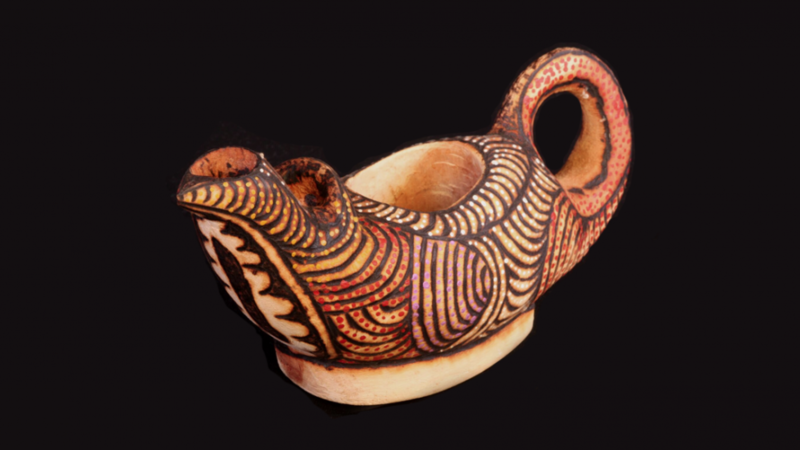 Works presented range from piti (wooden bowls), miru (spear throwers), tjara (shields), kulata (spears) to beautiful carvings of desert birds and animals. The exhibition also features photographs, audio and film. In Punuku Tjukurpa, Anangu share their culture, knowledge and the Law that forms the basis for the intricate designs and markings and the stories that accompany them. Below are free downloadable resources for educational groups visiting Punuku Tjukurpa. An Artback NT Touring Exhibition. Caption: Niningka Lewis, Teapot, 2013 [Itara (river red gum), acrylic paint].